In a place as beautiful and serene as northern Lake Tahoe, it’s hard to imagine that anything could make your stay better. Immersed in a stunning landscape of towering mountain peaks, lush forests, and of course, the glittering waters of Lake Tahoe itself, a vacation along Lake Tahoe seemingly provides visitors with all of the exciting outdoor activities and tranquil relaxation that they could ever ask for. Yet, at Tahoe Signature Properties, we know that sometimes it’s the littlest details that make a difference in your vacation experience—including extra amenities when you rent a cabin rental in Lake Tahoe with a hot tub where you can soak your cares away, surrounded by breathtaking forest and mountain views. 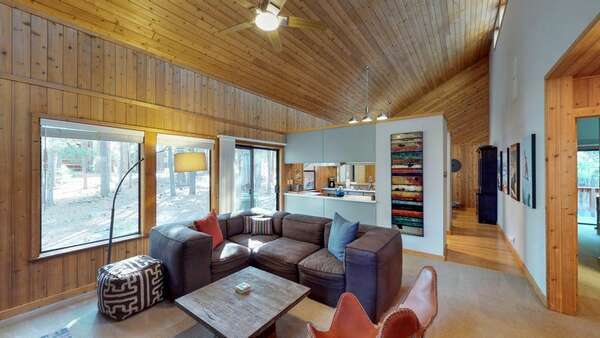 See our selection of cabin rentals in Lake Tahoe with a hot tub down below! Our Lake Tahoe cabins with a hot tubs feature homey details that infuse these spaces with a rustic ambiance, calling out to your innermost soul to escape from life’s daily troubles and enjoy the serenity of Lake Tahoe. Custom touches abound in these luxurious Lake Tahoe cabins with a hot tub. Intricate stonework, handcrafted cabinetry, wooden and leather furnishings, hardwood floors, and charming alpine décor give these properties a sense of being your home away from home. Snuggle up next to the fireplace in the living room as you lay back on comfy couches and chairs, watching a show or movie on the high-end flat screen television. Of course, downtime relaxation can also be found in the form of time spent by the fire pit outside, or enjoying the view from the hot tub. Some of our homes also come with access to community amenities like tennis courts, resort-style pools, and more. Take advantage of the pristine gourmet kitchens in these Lake Tahoe cabin rentals with hot tub, outfitted with shining granite countertops and stainless steel appliances to make your meals a breeze to prepare. Enjoy the rewards of your cooking at the bar seating, dining table, or even outside on the deck for a lovely forest al fresco experience. When you’re ready to turn in for the night, make your way to the immaculate custom bathroom to wash up with a hot shower or a soak in jetted tubs. Then, climb into the plush comfort of your bed and its soft linens, resting your head and waking to a vacation reality even better than your dreams. One way to enjoy the beauty of Lake Tahoe is to get up close and personal in a kayak or a canoe. But another way to get the big picture is to see it from the air. This is definitely not the type of activity that everyone will enjoy. Piloting your own aircraft is an adventure in and of itself. But it also requires a certain level of physical fitness and some skill. Knowing about the wind and how to guide your aircraft is paramount not just for a successful trip, but also for your own safety. Of course, you’ll have an instructor with you all the way, and if you panic, they will take control. The good part is if you’re training for a pilot’s license then this tour counts as experience. You can even fly as a couple, which doubles the fun. For the art lover, there’s always that anticipation that they might come across an exquisite piece of art in the most unexpected places. It’s like a treasure hunt. Even in the most remote places, you can always find an artist with a great talent. Blue Wolf Studios invites local artists and students with artistic talents to display their work. Here you can browse handmade items such as clothing, pottery, and jewelry as well as paintings, sculptures, and printed screens. You can also find books written by locals and visitors that focus around Lake Tahoe. The best part is you can buy any item you like at a bargain price. You never know what you might find there that will hang on the wall of your home for years to come. The health benefits of acupuncture and healing arts are as ancient as civilization. For centuries, people have used these alternative healing methods to ease tension, stress, and aching muscles. Using a combination of herbs, massage, body work, and yoga, you can achieve a calmness and relaxed state that will enhance your wellbeing. The spas that offer these healing arts are practically around every corner of our cabin rentals in Lake Tahoe with hot tub. Massage On The Lake Day Spa offers a variety of salt and herbal wraps and hot and cold therapy to soothe the pain and relieve stress. Incline Village Recreation Center, on the other hand, focuses on your overall fitness and offers tennis, swimming pools, ballroom dancing, and personal training. There’s also a senior fitness program for people over 55. Contact our reservations team to learn more about what northern Lake Tahoe has in-store for you when you book your stay in one of our incredible Lake Tahoe cabin rentals with hot tub!